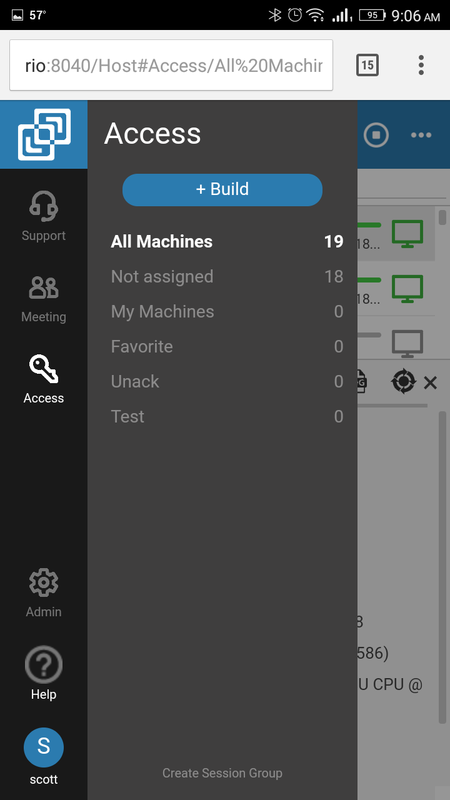 Great work on the recent ScreenConnect improvements. Nice to see continuous development. Can you show some screenshots of the new v6 UI on mobile devices? 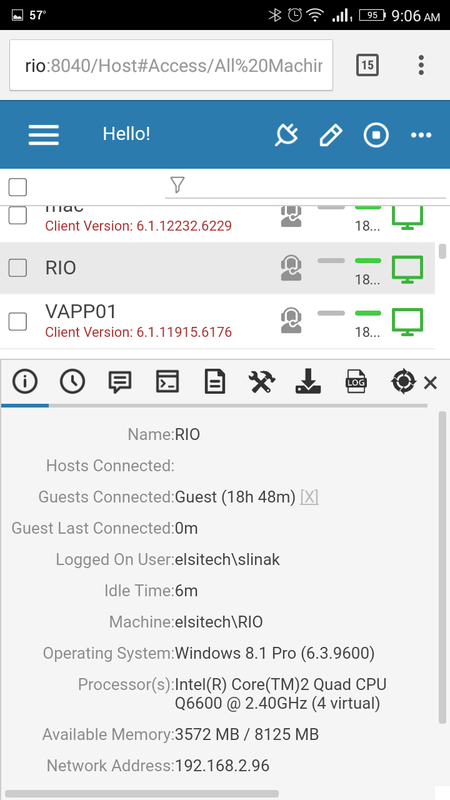 ... and is there a way to show device connection status with the new v6 UI on mobile devices without having to continuously rotate the device from portrait to landscape mode (e.g. on iOS iPhones)? I would also like to see the v6 UI for Mobile. Let's hope the default theme is properly responsive, that would set a great example for all feature third party themes as well. The 6.0 mobile UI is a bit of a mess so I'm hesitant to post a screenshot of it quite yet. I've registered several issues relating to it and as soon as they're addressed I'll post something here. Now that v6 is stable is there any update on the mobile UI? Especially for iPhones? @futura nothing yet, but I will bump the issue's priority with the development team. A wee bit confused here... so v6 is stable now but does it still have the old mobile UI? ... or does it have the new UI but still with a few kinks? It does reflect the updated UI but there are still a few kinks being sorted. I updated to the v6 stable and it totally jumbles up the user interface of the iPhone app with v6.0.11299. Any updates on how the mobile app is progressing? I'm sure there are a few other ideas, but I submitted my idea on the Feature Request forum, here: http://product.screencon...s/566-60-ui-suggestions/ . You should add yours too, I think we all feel the mobile UI could use some refinement. I've been asking for years for the Mobile UI to be revamped, I stopped holding my Breath a while ago. Something is always broken or not working correctly in every version :( And the answer is ALWAYS we are working on it or its coming out. Its been several years and the Mobile UI is still very Temperamental at best. Looks even worse than I thought, less usable space and more bloat. They should have listened to their users about what was most important to them! Please make the portal responsive or at least serviceable for mobile. We can't upgrade to v6 because of this. 2 users thanked clarence.chiu for this useful post. Hi Scott, is there any improvement in the Mobile UI for the upcoming 6.1 release? To my knowledge there are no changes to the Mobile UI included in 6.1. FYI, we bit the bullet and just upgraded from 5.6 to version 6.1 now that it is stable. The interface in the iOS app on an iPhone 6 is not horrible... it's about as good (or bad) as the previous version. If you install the "Fluid Panels for ScreenConnect 6" extension from Steven Dove it makes the interface more usable. Thanks Steven! 1 user thanked futura for this useful post. We still have a bit more work to complete, but 6.2 should have some updates to vastly improve the mobile web page experience. Here are some very early screenshots, please be aware that things are subject to change. As with everything, feel free to leave feedback. That's a good improvement. I like what you are doing with the connection status icons/display as well. I agree. It looks like a step in the right direction! Thanks for recognizing the importance mobile support & keeping us appraised of the progress. Finally looks like something decent to use! I opened a feature request to add TouchID support to the iOS app about a year ago. Has there been any additional thought given to adding TouchID support? iPad's, iPhones, and Macbook's all support TouchID now, so it would be really helpful for those of us that use complex passwords to login to the App.